When Witch invited me to dinner on a Monday evening, I had suspected something was amiss. My suspicion was confirmed that evening - it was a birthday dinner for both me and Caroline. Both Caroline and I share the same birth day and month, which is December 1st. But while it had been a complete surprise for Caroline, I was not that easily fooled! Which is quite a pity, cos surprises are always good, especially if it's a pleasant surprise. 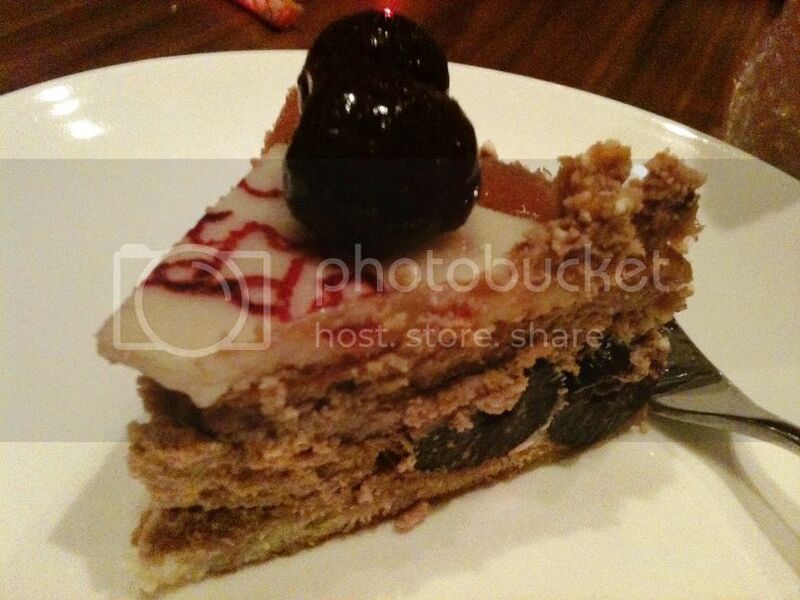 We had dinner at this restaurant, bistro and bar called Mezze located in Medan Damansara, KL. It was our first time there, so I did not know what to expect. These were the dishes we ordered. (Sorry for the low quality photos as I did not bring my camera along - I had to depend on my iPhone 3Gs). This dish looked rather unique with the raw egg yolk served in a shell. 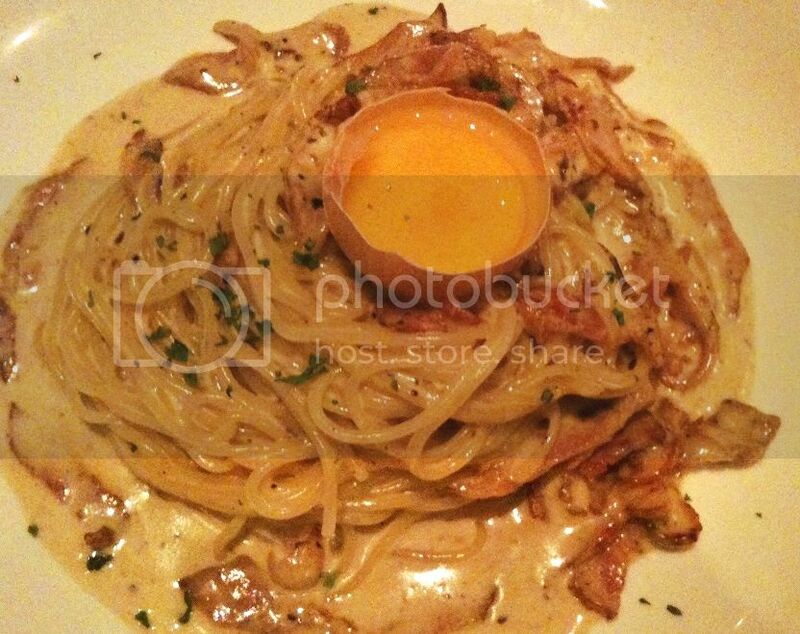 The taste was not bad, but after mixing the egg yolk with the pasta, it was a bit too creamy for my liking. 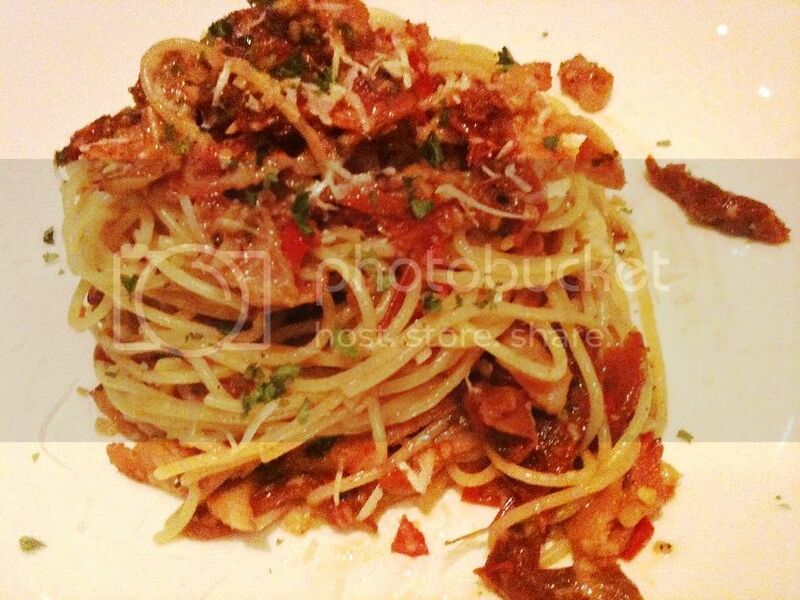 This pasta with bits and pieces of bacon was delicious! I would definitely recommend this dish! 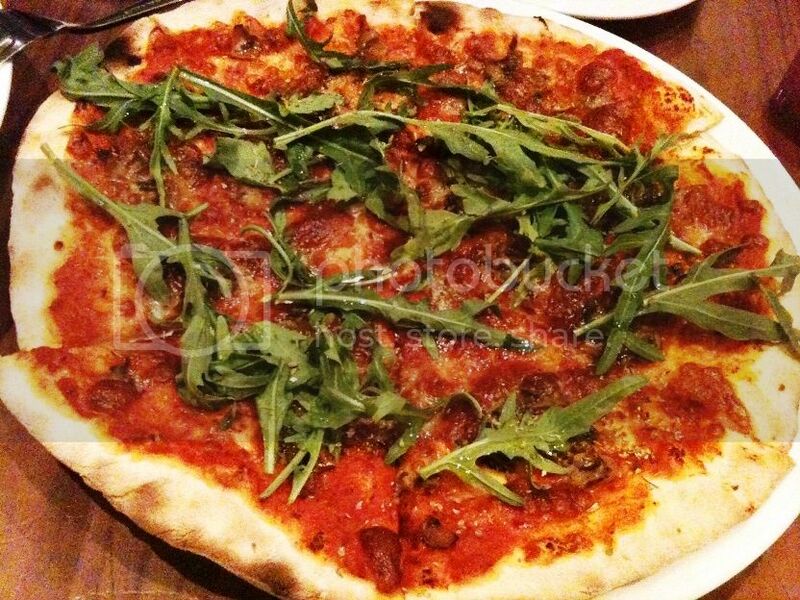 This pizza with thin and light crust was yummy. With mushrooms, tomatoes, oregano, rocket leaves, truffle oil and layers of cheese on top, it was really quite delicious! 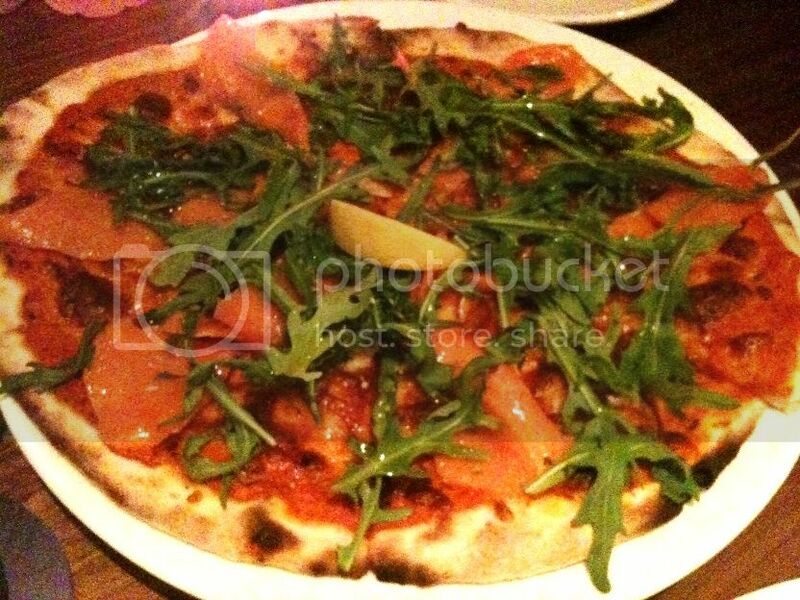 I love salmon so this pizza is a favourite of mine! Thin and crispy crust with slices of smoked salmon on top, it was love at first bite! I thought the rocket leaves somehow matched the salmon very well! 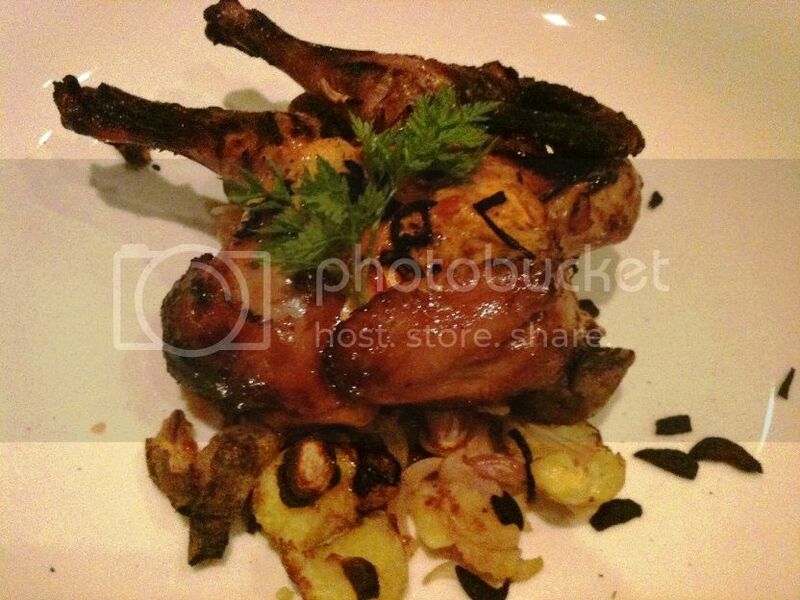 I have only one complaint about this dish - the chicken was way too small! It was hardly enough for one person, what more for all of us! (there were six of us there). Other than the size, everything else about this spring chicken was delightful! The meat was tender and juicy - it must have been very well marinated. I wish I could have the whole chicken to myself! I was craving for some desserts, but both Caroline and I knew that there would be a birthday cake for us. 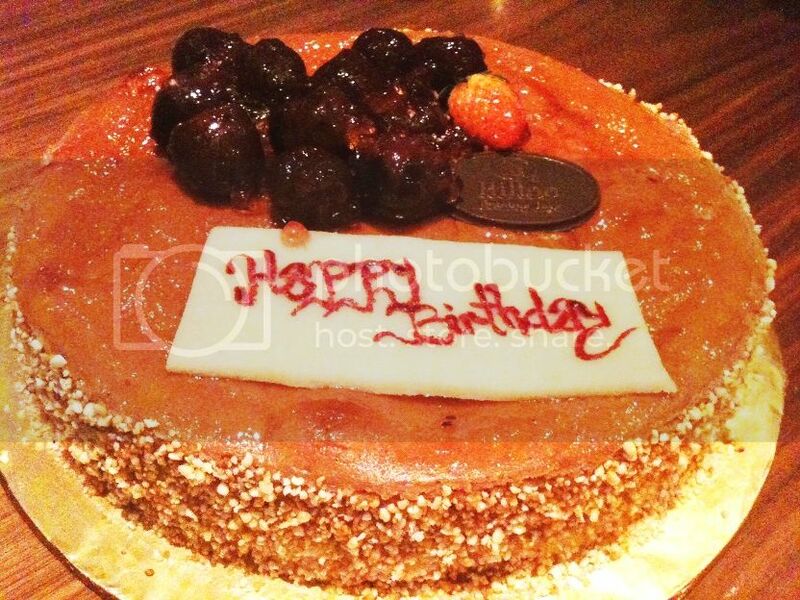 And true enough, we were presented with a Cherry Cheesecake bought from Caffe Cino, PJ Hilton. I guess Witch was a bit disappointed that both Caroline and I did not at least pretend to be surprised haha! So after the birthday song was sung and we both blew the candles, the cake was cut and I got to taste a slice of my birthday cake! Thank you for the delicious cake! 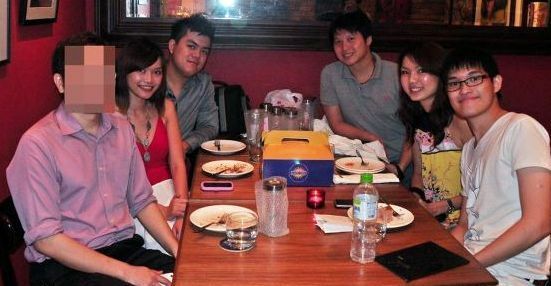 Here's a group photo of us which I have taken from Caroline's blog, with my face blanked out as usual and the birthday girl sitting next to me. Mezze was a good place to dine and we had a great time. The only issue we had with the place was the smoky environment. Obviously they did not have non-smokers in mind! That's a real pity because the food were really quite good!